The final tomb we visited in the Burren forest was the wedge tomb on Tullygobban hill, it is quite similar to the Giants Leap, but this tomb is quite ruined , the chamber can still be clearly made out but now only three of the original capstones remain and all of these are displaced. Many of the kerb stones can still be spotted around the central gallery. Just about 8 metres south west of the monument is a small round cairn 5 metres in diameter, only the kerb remains giving the appearance of a small stone circle. If this wedge tomb were anywhere else it would probably get more attention, but because this area is so rich in megalithic tombs this one is probably not given the appreciation it deserves. 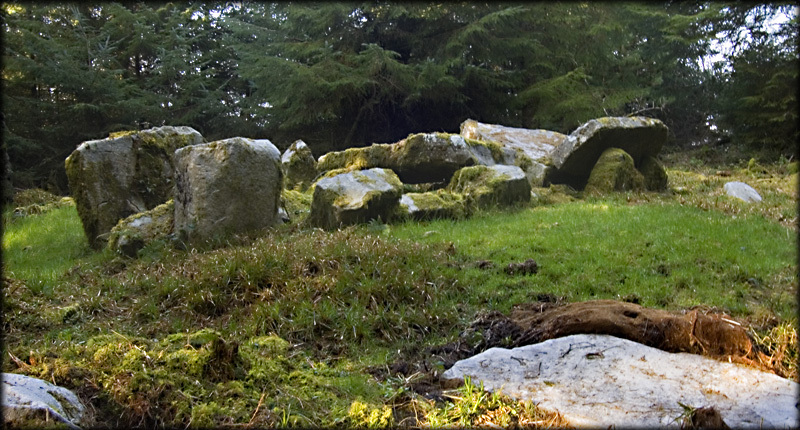 Situated: In the Burren prehistoric complex About 5 kilometres south of Blacklion on the Cavan Way. After you enter the Forest, this tomb is approximately 600 metres down the trail on the western side, follow the sign opposite the boulder burial and the tomb is about 80 metres through the forest in a clearing on top of the hill. Discovery Map 26: H 0740 3527. Last visit Apr 2007.